Team Cornwall has established bursaries to acknowledge the important role youth play in shaping the future of our community. Each bursary has its own criteria and selection process. Available to an entrance student enrolled full-time in any program on the Cornwall campus of St. Lawrence College. Applicants must demonstrate above average academic achievement and contribution to community service, and be residents of the City of Cornwall or the United Counties of Stormont, Dundas & Glengarry. Applications are made directly to St. Lawrence College. While academic achievement deserves recognition, Team Cornwall believes that youth should also be recognized for demonstrating strong qualities of character and good citizenship. 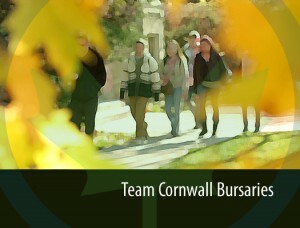 Bursary recipients are selected by each Cornwall high school. The award is presented by Team Cornwall. Presented by Kawartha Credit Union The Youth Volunteer Bursary honours extraordinary individuals attending Cornwall Secondary Schools whose volunteer achievements have contributed to the well-being of their community. There are three (3) bursaries of $1000 each made available each year. The program is fully funded by Kawartha Credit Union. Senior students at the following high schools interested in pursuing or accepted into a university or college post-secondary program are eligible for the Youth Volunteer Bursary. Nominations are reviewed by a committee. Please click on the link below for the nomination package. Deadline for submission is May 26th, 2018.